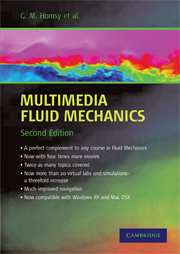 Inspired by the reception of the first edition, the objectives in Multimedia Fluid Mechanics 2/e remain to exploit the moving image and interactivity of multimedia to improve the teaching and learning of fluid mechanics in all disciplines by illustrating fundamental phenomena and conveying fascinating fluid flows for generations to come. Operates on PC and Mac OSX. Apple has released a piece of software called Rosetta and it adds the functionality required to make the existing DVD work properly with the latest Apple operating Systems and with Windows 7. No additional development work is required. The install of the Rosetta software is automatic if not already installed - the only requirement is that the Mac be online or the user have the original OSX DVD (if not online). Praise for the First edition: "Homsy and his colleagues have now provided us with a new and powerful teaching aid...This CD is an ambitious project, and, in my view, it has been accomplished with remarkable success...I have no doubt that this CD-ROM should be regarded as a 'set text' for viscous fluid mechanics courses at the undergraduate or starting graduate levels." Praise for the First edition: "It is impossible to do justice in a short review to the range of video clips available...A student could learn a lot from browsing through the material on his or her own PC... Overall I liked the CD very much indeed, and at the price it represents excellent value. It should be snapped up immediately by university lecturers, students and school Physics departments." Praise for the First edition: "...a very useful addition to standard fluid mechanics courses for undergraduate students." "Homsy (Univ. of California, Santa Barbara) and collaborators are to be lauded for producing this remarkable source, which brings a whole world of fluid mechanics to one's fingertips. With the DVD, teaching fluid mechanics is no longer the same." "... A significant upgrade from the earlier versions."